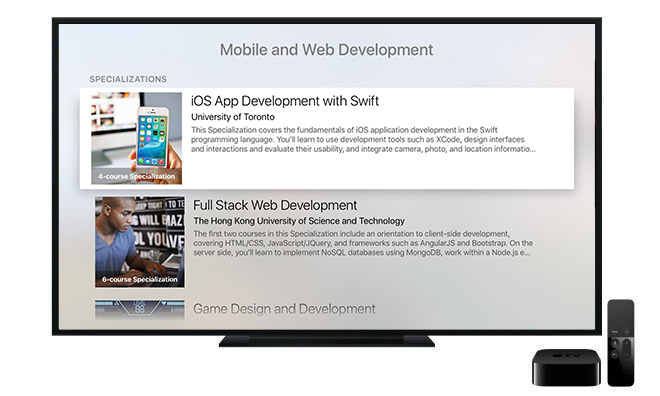 We’re thrilled to announce that Coursera content will now be available on Apple TV. Coursera’s mission is to expand access to the world’s best education, and as part of pursuing that mission, we’re committed to providing course content on a wide variety of digital platforms. Our Apps for iOS and Android brought on-demand learning to people’s busy, on-the-go lives. Now, with Apple TV, we’re extending availability to your home. TV availability isn’t only a first for Coursera — it marks Apple TV’s first ever introduction of online learning to its platform. Everything you can do online at Coursera, you’ll now be able to do from the comfort of your Apple TV device: browse our entire catalog of courses, explore new topics, watch video lectures from top academic and industry experts, complete quizzes and assignments, and earn Course and Specialization Certificates. At Coursera, we’re committed to helping people change their lives with a great online learning experience. Whether your goal is to advance your career, further your education, or simply enrich your life, we want to provide you with the world’s best educational resources on the platforms you use every day. Offering our content on Apple TV is an exciting step toward that goal. If you’re ready to start learning today, head to the App Store and download Coursera’s App.